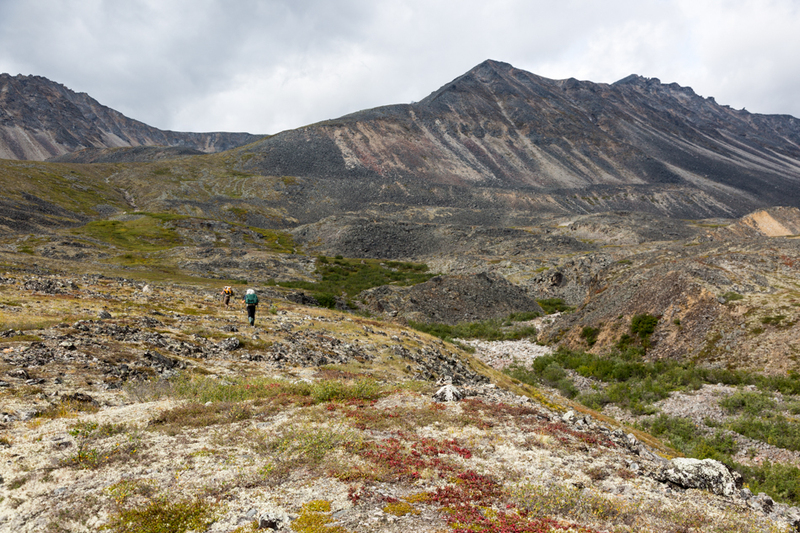 The Brooks Range has always intimidated me as a logistic challenge: expensive, remote, cold in the winter and buggy in the summer. But it is the largest swath of Alaska I haven’t seen, and with a lot of planning, we were able to do a long and remote trip within my budget. We had to have the route, logistics, and pace, dialed-in to pull off this ambitious trip. 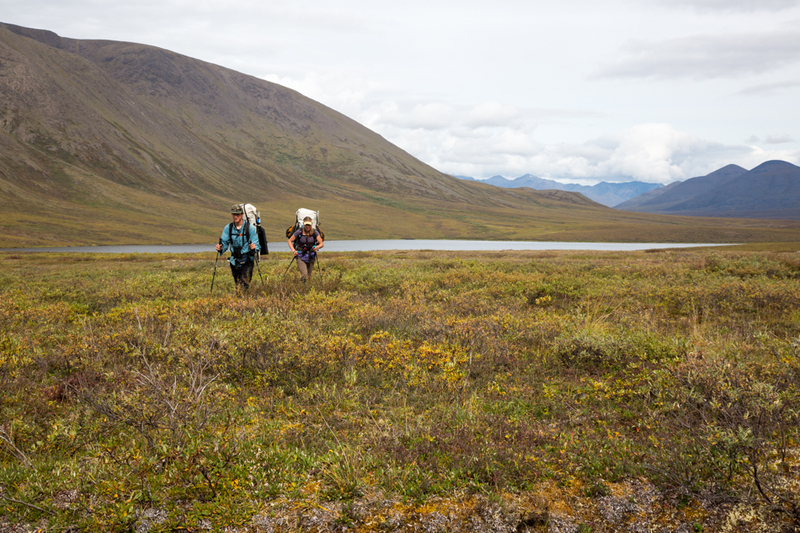 Our route evolved to be: fly to Anaktuvuk, float southwest on the John River, hike west to the Alatna River, float southeast on the Alatna to access the Arrigetch, cross the Arrigetch, float northwest on the Noatak River, hike southwest to the Ambler River, and float west to Ambler. 400 miles in 19 days. The logistics and planning process was interesting for me, and I’ve described it in detail below the photos. Our first week was hard, several 12+ hour days. 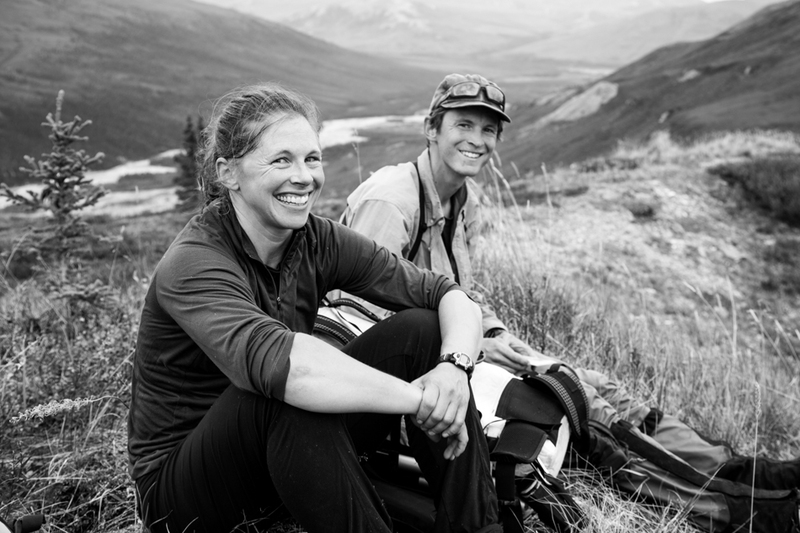 Ben Histand and Diana Johnson had time to hike in from the haul road to Anaktuvuk (60-miles and a true border-to-border traverse of the Park), and met us (Sarah Histand and me) at the Anaktuvuk airport. Their extra days were long, featuring snow and cold nights in their too-thin sleeping bags. Their feet would have appreciated some down time in Anaktuvuk, but now the clock was ticking and Sarah and I were anxious to start the adventure. 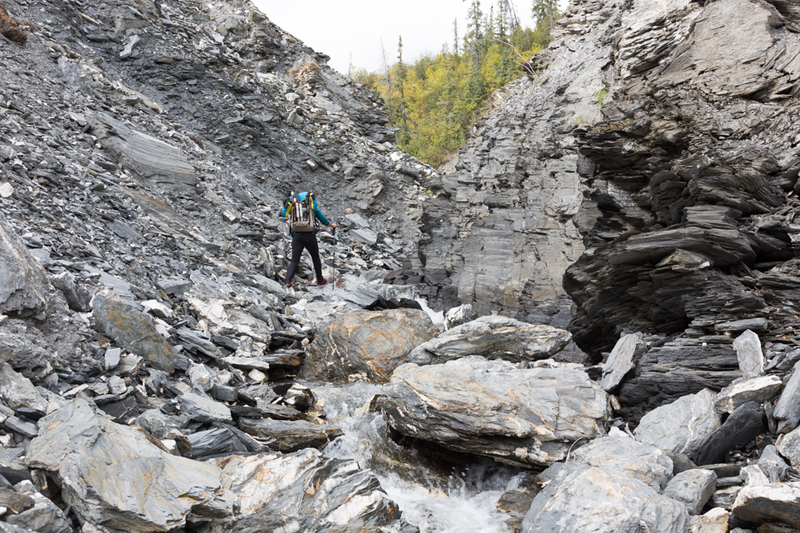 Balancing weight and comfort, which is closely related to recovery, is tricky going into new terrain, especially in the arctic. Ben and Diana made a handful of gear choices (or not choices, depending on what they could borrow) that made the wet days more difficult. The John River was splashy, and their old boats left them soaked, while Sarah and I stayed drier in the newer models. 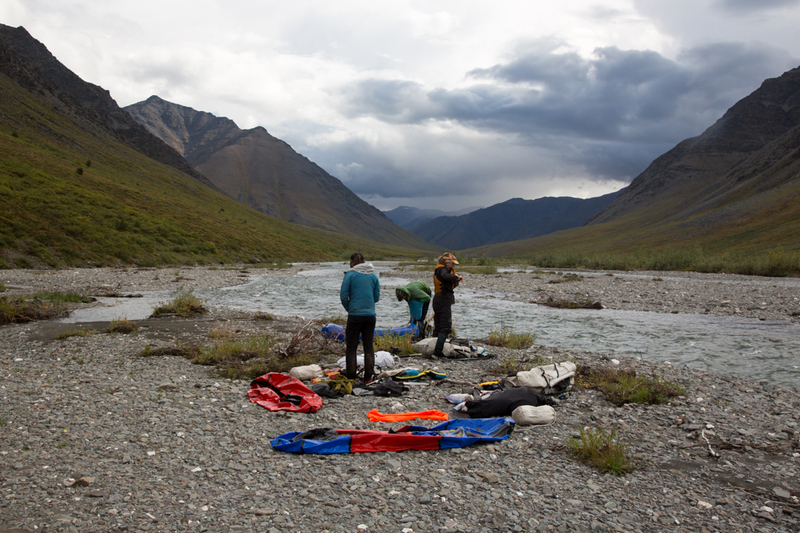 Ben and Diana shaved weight by bringing +40 sleeping bags which turned out not to be warm enough (we brought in Ben’s 0-degree bag on the Anaktuvuk flight) and Ben slept on his packraft instead of a pad. It is a constant game, trying to save weight but bringing enough stuff to sleep well at night. But the game is less serious if you are able to laugh off the discomforts, which Ben and Diana did. We left the John River at Hunt Fork, working our way west to Gaedeke Lake. 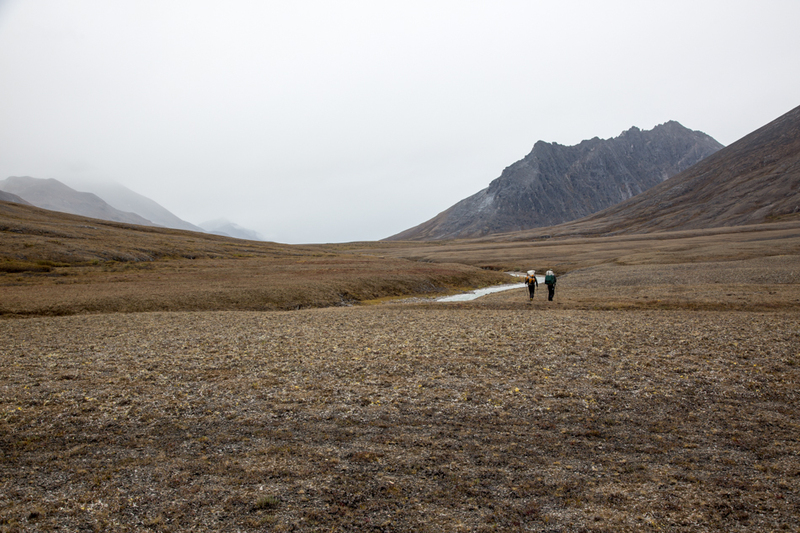 We anticipated bad tussocks along the valley floors, so we took ridges whenever possible. 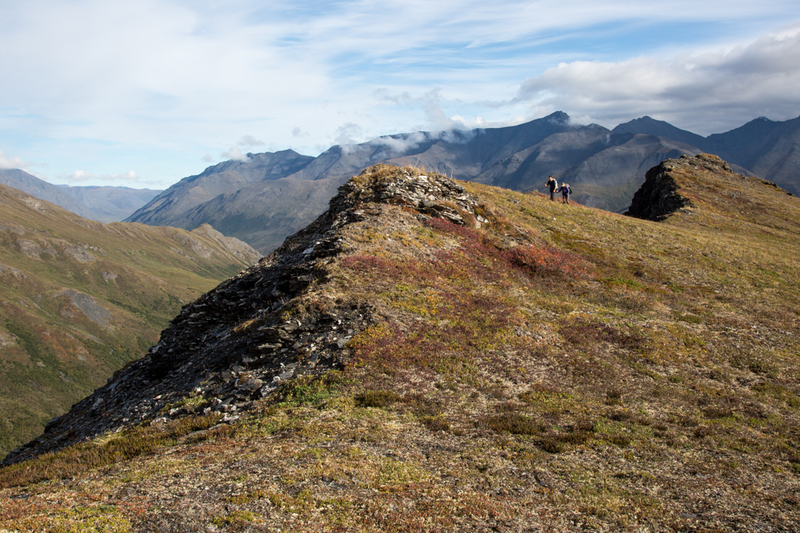 The ridge walking was incredible, a gift from the arctic. 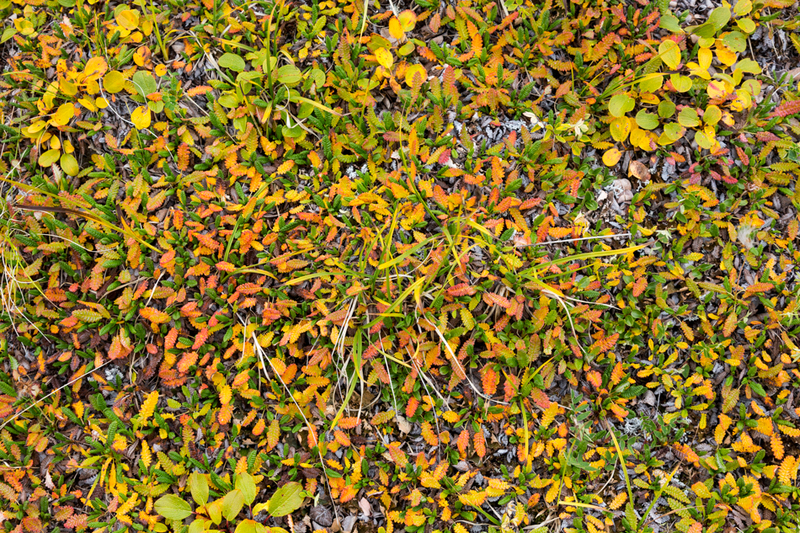 We also spent a lot of time in the tussocks, but they weren’t terrible. We didn’t have much visibility these days, but the complete lack of bugs was a major morale boost. We had plenty of company too, hundreds of caribou. After six days of travel, we reached Gaedeke Lake around 11 pm, and were met by John Gaedeke. John’s dad built the lodge at the lake before the Park was established. John helped us with our two food drops and was clutch to making this trip happen, see the logistics section below the photos for more of an explanation. John brewed some hot chocolate and apple cider. Ben had flown in a pineapple, and John thought that was probably the first pineapple to have made it to the lodge. 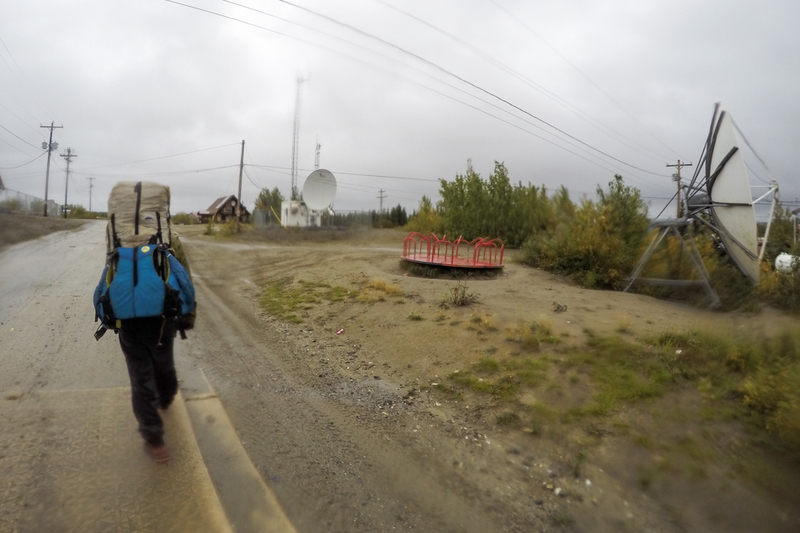 We ate a warm breakfast, eggs, bacon, sausage, and continued toward the Alatna. 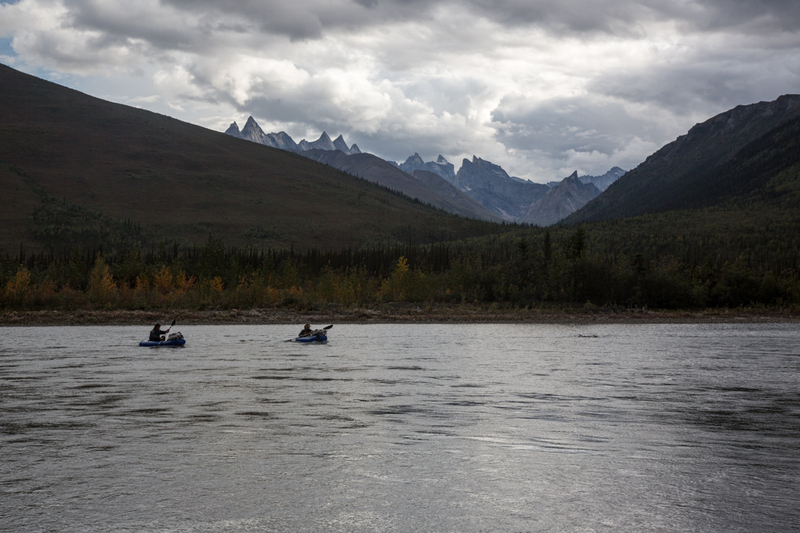 We all agreed that the Alatna float was one of the highlights of the trip. The water was low, but clear. We had sunny days for the float, which helped keep everyone warm, even through the splashy sections. 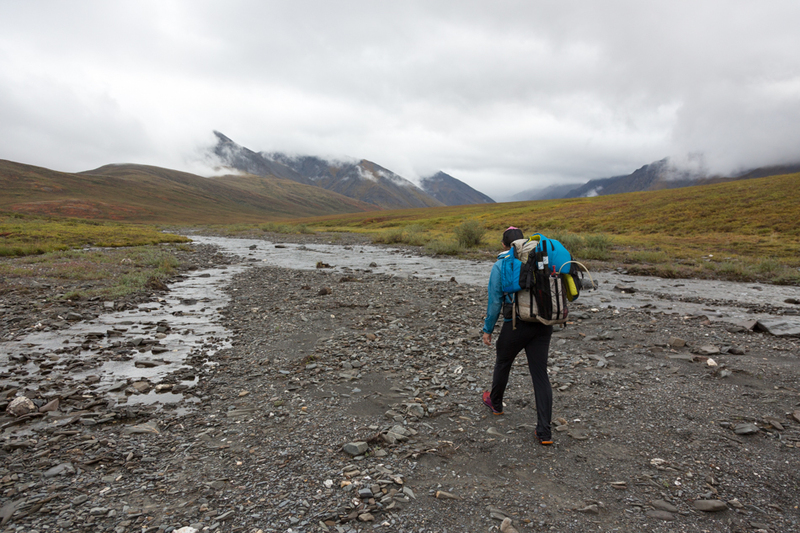 We spent a day hiking a cache from the Alatna to the Noatak over Portage Creek. Setting our hiker’s cache ended up being an exhausting 25-mile day, but it allowed us to pass through the Arrigetch with very light packs. After hiking the ridge toward the Noatak, we tied six kevlar bear bags in the tallest trees we could find near the Noatak; it reminded me of the children’s book Caps for Sale, with hats, monkeys, in the trees. We returned via the creek bed on good game trails. 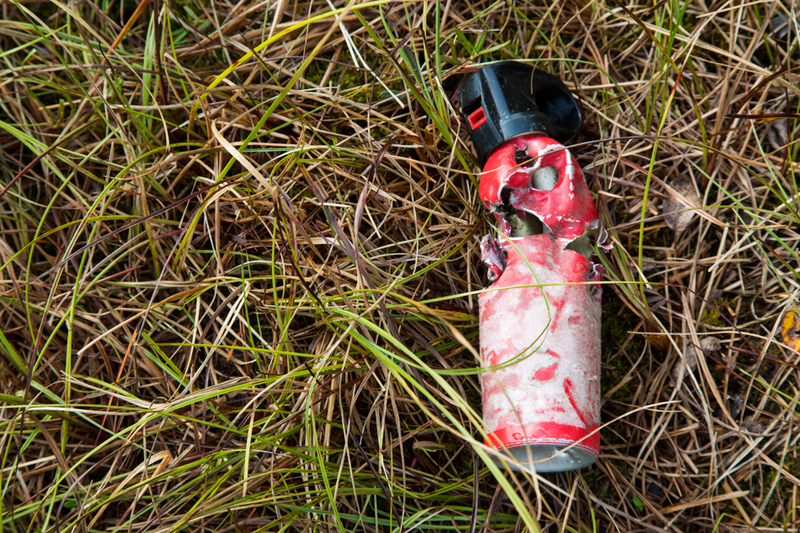 We found a can of bear spray that had been chewed by a bear. 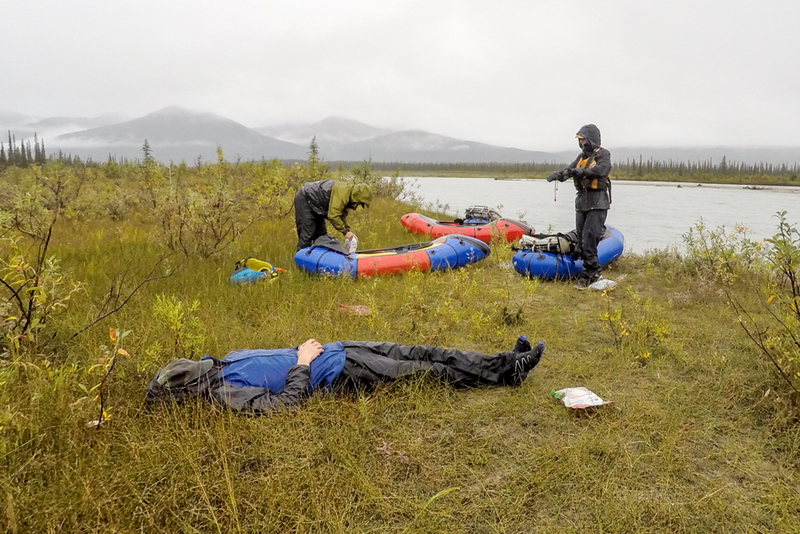 We had time to kill on the Alatna before our scheduled meeting with John at Circle Lake, so we floated half-days to recover from the hard previous week. We met John, re-packed our food (including cookies from John’s mom), and continued into the Arrigetch. 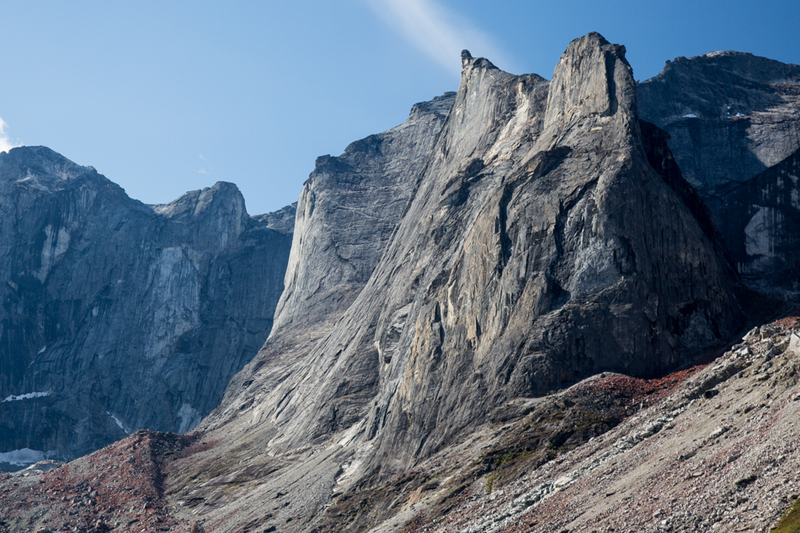 The Arrigetch are an anomalous pod of granite faces and towers in the heart of the Brooks Range. It was awe-inspiring. Our route was over Ariel pass as outlined by Roman Dial. 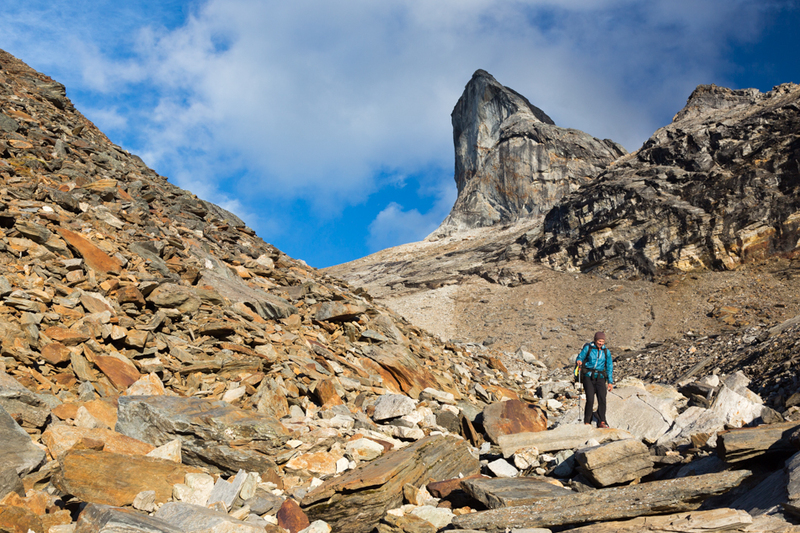 I had been describing this part of the trip as the ‘exposure crux’ so that everyone was prepared (the hike to Gaedeke Lake was the ‘morale crux,’ and the flat-water Ambler float was the ‘restless-legs crux’). I got to the pass and it looked nasty, much worse than expected. 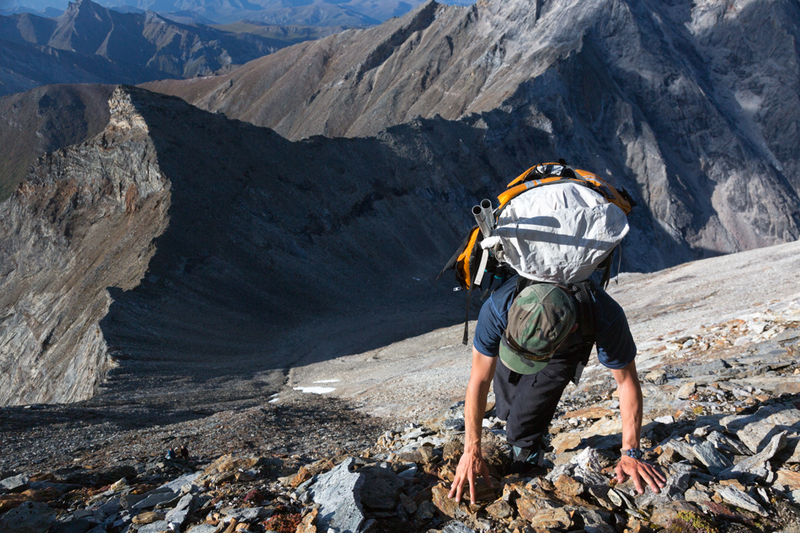 I dropped my pack and spent a few hours trying to find a line through the 600-foot cliffs. I could make it half way down, with some sketchy moves, but then I couldn’t see a line through the lower cliffs. I checked in with Ben, let him know that it didn’t look good, but that what I could see on the shoulder of Ariel might go. Ben headed up Ariel to check that option. I returned to Diana and Sarah defeated, letting them know that it wasn’t the right route for us, and amazed the Roman and others had found a line. Ben returned from the shoulder of Ariel and said that it went. We scrambled up and found the descent that matched Roman’s descriptions. It was the most exhausting day for me, and mostly mental, nervous about everyone’s comfort with exposure, feeling the pressure to pick a safe line, blaming myself for selecting a route that wasn’t going to work. 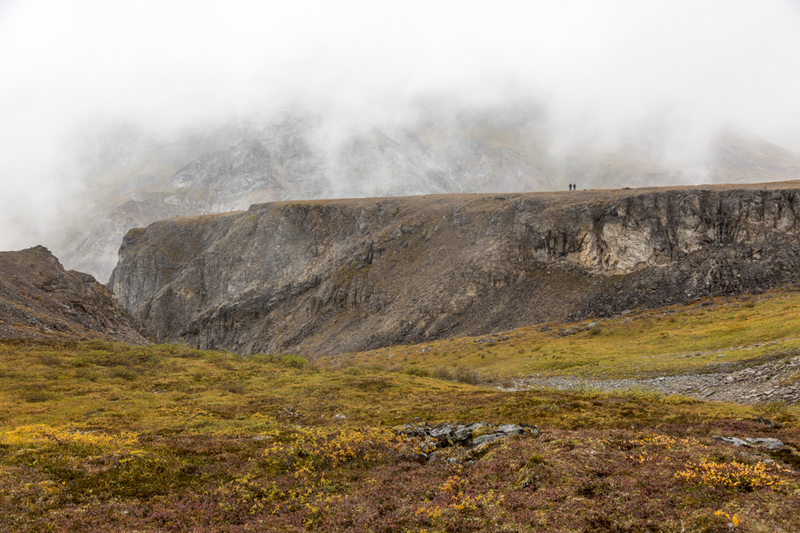 The next day was my 38th birthday, and we spent it hiking toward the Noatak. Sarah and I watched a bear for a while, our 11th grizzly. We were uphill and downwind, so the bear didn’t know we were there. The rest of the bears had all sprinted away as soon as we made noise, and we expected this bear to do the same. Instead, when we started making noise it circled around us, not scared, but not aggressive. It was moving a little bit closer while circling, and my knees got wobbly; I didn’t know that was a real thing. Finally it got a whiff of us, a whiff of Sarah, to be exact, and turned around to run a half-mile away. It was a good lesson for me, that we should have walked around instead of counting on a pattern of behavior. We finished the day with a blueberry cheesecake creation that Diana made for my birthday. 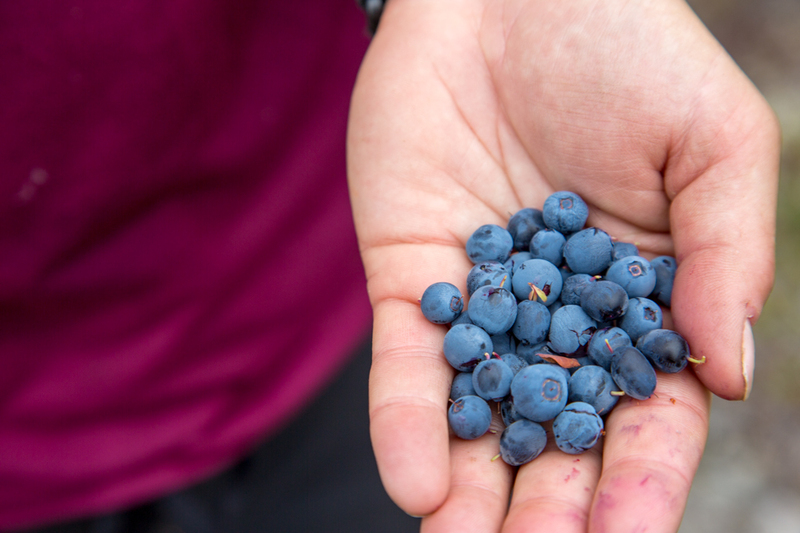 The berries were incredible the entire trip. The Noatak was pleasant, flat, but pretty. We started seeing a lot of float-groups. It was the least interesting of all the water we saw, so I found it strange to be the primary destination for floaters. 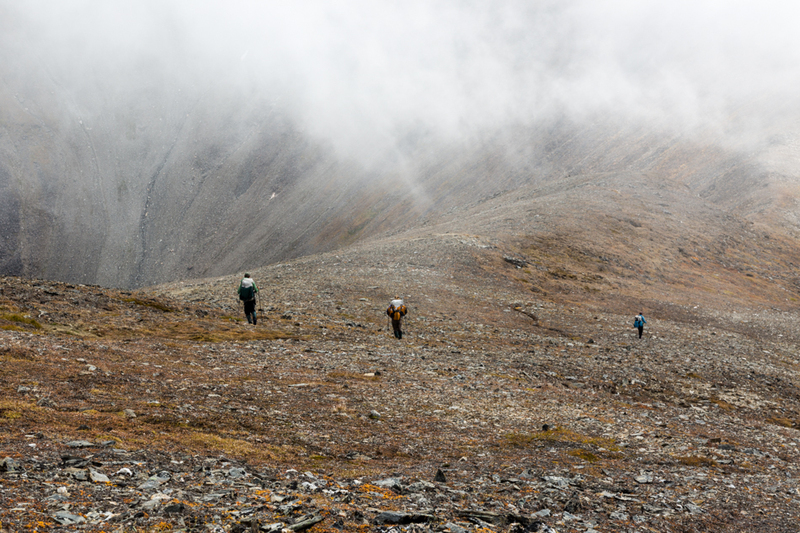 Crossing Nakmaktuak Pass to reach the Ambler was another highlight, even though we didn’t see much of the mountains due to the low clouds (Brad audibly groaned in disappointment when I told him we didn’t get to see the mountains). Some of the walking was ball-field flat, and all of the walking was pretty good. The Ambler canyon was deep and impressive, we stayed on a shoulder and had a few glimpses into it. The Ambler River was impressive too. We watched the water change from clear and frothy to high and muddy in about 30 minutes as a flood built up. It made the first rapids a bit more challenging than we were prepared for (Class III), so I boat-scouted, signalling the group when and where to portage. Eventually the river mellowed and we were able to stay in our boats. We floated through a very cool mini-canyon with an overhanging wall. The Ambler river would definitely be worth a return trip. We made great time on the high-water float to Ambler, and received a warm welcome, coffee from the City building, showers from the school, and rides to the airport from principal Scott Lefebvre and the Ravn gals. Sarah got to sit up front with the pilot and they spent half the flight looking at maps and talking about our route and other trip options in the area. We spent the night in Kotzebue and flew home the next day. I wasn’t ready to head home. The fast pace, constant route-finding, and re-supply each ~week, made for a really nice daily routine. I dreamt about route finding for the first three nights back home. 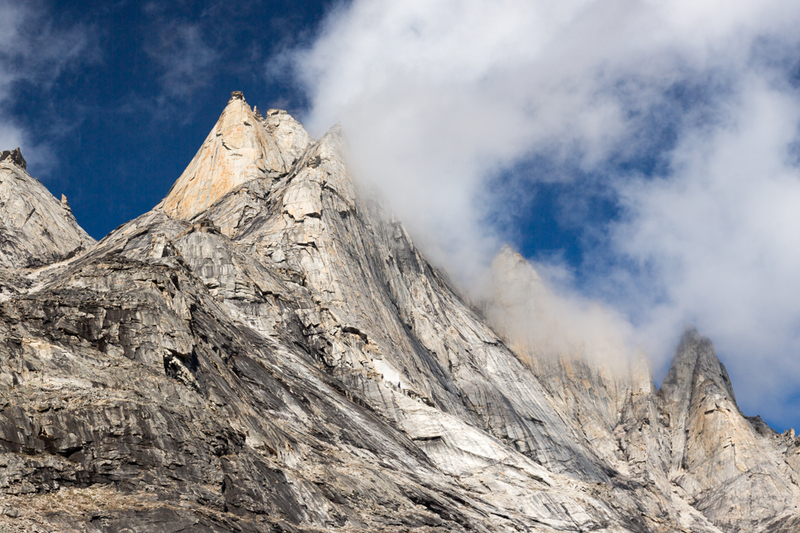 Sarah woke up two nights and struggled to understand where she was, seeing mountain forms in the shadows of the room. I dreamt about a bear encounter on my fourth night home. At the end of the week I dreamt about software installation on my new work computer. Sigh. Back to the (other) real world. 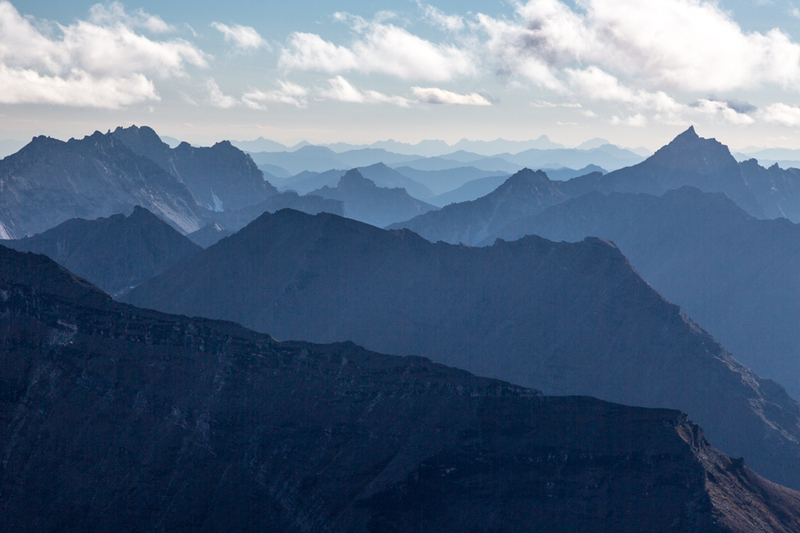 The Brooks Range is a huge swath of Alaska. I haven’t been very motivated to explore the Brooks Range beyond the road access because flights are expensive (>$1000 RT). I plan most of my trips from roads or at least commercial air strips (towns and villages) to save money, but there are only a few villages in the Brooks Range. Anaktuvuk is the most centrally located, so it was the clear choice. Even though Anaktuvuk is only 10 miles from the north slope plains, the John River, which basically starts at the airport, flows south into the heart of the mountains. Commercial flights are affordable, $190 one-way from Fairbanks. With the start point identified, we started looking for a destination. The commercial options were the villages of Bettles, Ambler, and Noatak, all with ~$250/person one-way flights. 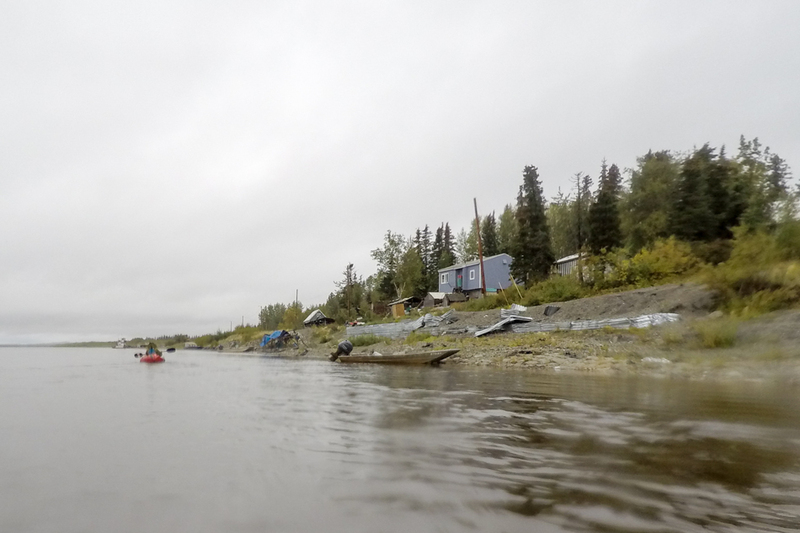 Bettles is a direct float on the John, a bit more straightforward than we wanted, and Noatak ends with a 300 mile flat-water float, a bit more leg-numbing than I wanted. So… Ambler. The only thing I knew about Ambler is that there is a road proposal (from the haul road to Ambler), through complicated arctic tundra. I know it is hypocritical (as a human who owns manufactured goods) not to support resource development, but I don’t. The road sounds like a horrible idea. Sarah and I started exploring Google Earth to choose a route. 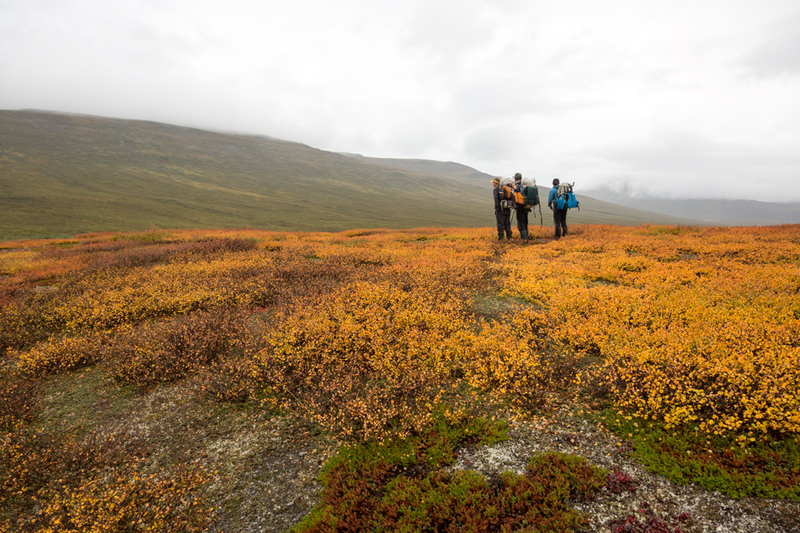 We were mostly balancing our interest in seeing the Arrigetch Peaks, with anticipation of slow hiking through tussocks and tundra. The other major factor was being concerned about bears, and we ideally wanted a group of four (bad bear interactions are nearly non-existent with groups of four and larger). Sarah asked her brother, Ben, who was her primary adventure partner when they were both single. The timing was right for Ben, and fiancee Diana Johnson. We hadn’t all traveled together, so we prepared separately, in ‘independent-nations’ mode, which would allow one couple to peel off if paces didn’t match or folks needed to go out in a rescue effort. Ben, Diana, Sarah, and I started collecting route beta, and identified our shortest option, 300 miles, about two-thirds floatable. 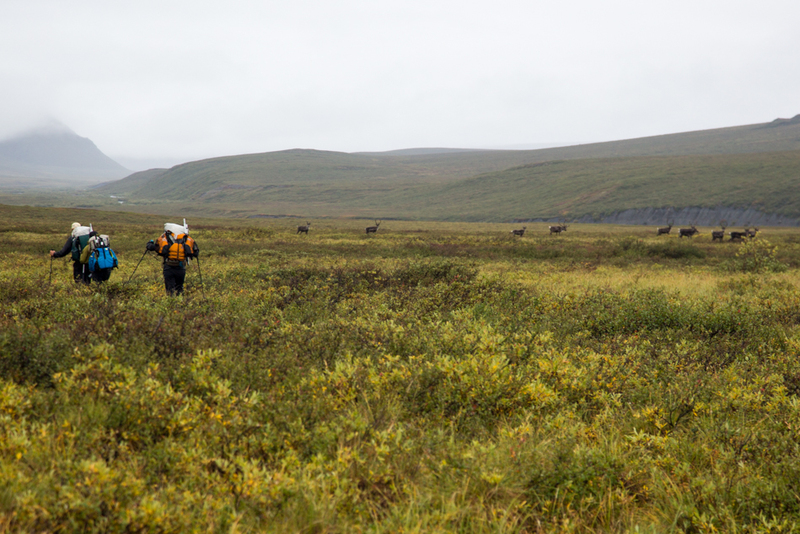 I anticipated that carrying a full pack (60+ lbs) on tussocks for the hiking sections would not allow us to cover enough ground, so we started looking into options for food drops. The food drop logistics were depressing. Friends were flying in and out of Circle Lake (at the base of the Arrigetch) 10 days before we would be there, and we could potentially back-haul our food in, but we’d need to figure out bear containers, how to get them back out, and gamble on the food lasting 10 days. One air service didn’t bother returning our calls and emails, presumably because they were fully booked for the peak mid-August season. A chartered flight would have cost at least $700 for a single drop. 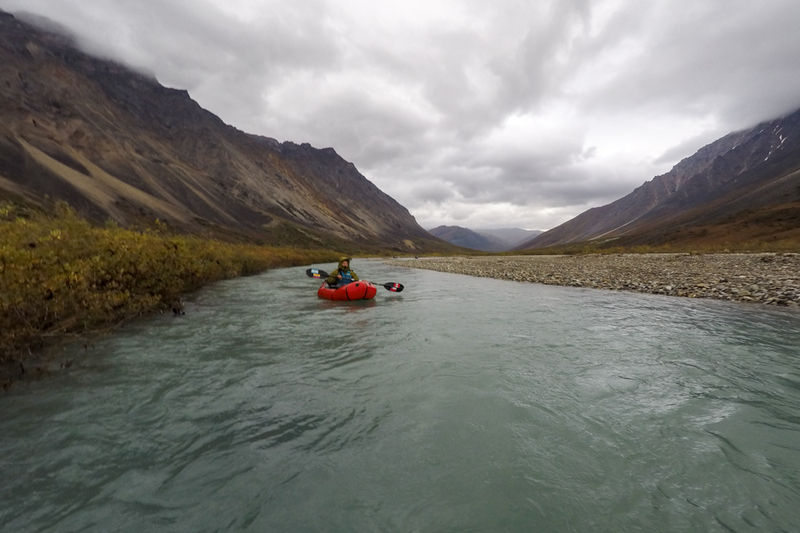 The other complication is that we really wanted the drop, or a second drop, on the Noatak River, west of the Arrigetch crux, so that we didn’t have to carry a heavy load over the steep pass. A flight (or additional flight) to the west side would have cost more, or have to come from Kotzebue, which would require shipping the food to Kotzebue first. The complexity and cost were enough to make me want to pull the plug on the trip. Sarah and I started talking about other trip options. 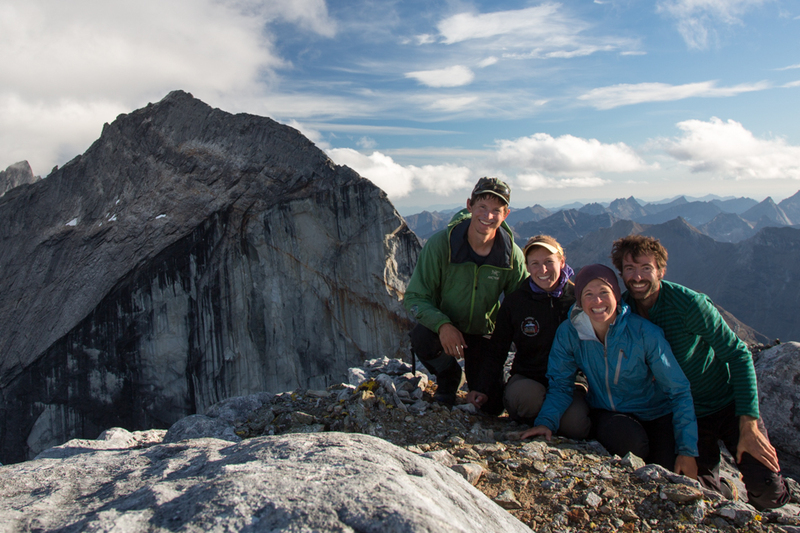 Brooks Range guide John Gaedeke came to our rescue. John had emailed me last winter for tech advice on a slide show, and to let me know about the no-road-to-Ambler campaign. In our email exchange he mentioned his family lodges in the Brooks Range, (most notably Iniakuk Lodge) and offered logistical help if I ever planned a trip through there. I emailed John at the last minute, expecting him to be in the mountains and out of reach. He got back to me right away, keen to help. John’s support was a total game-changer. Even if he hadn’t been able to help, his responsiveness and enthusiasm were so refreshing that I grew more excited about making the trip happen. We ended up sending food with two of John’s guided trips, one to Gaedeke Lake, the other to Circle Lake, paying the difference for the larger planes to accommodate our food weight. 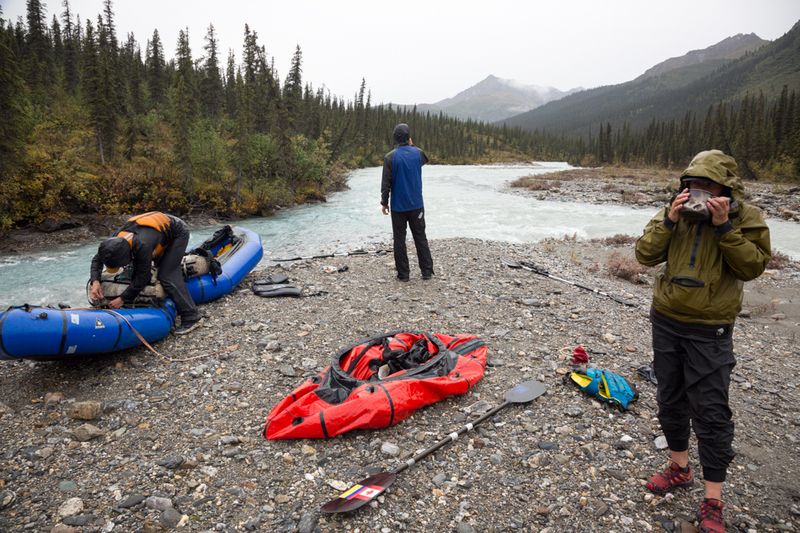 Gaedeke Lake, at the top of the Alatna River, was not on our direct route, so we revised the route, adding 100 miles. The Gaedeke Lake drop would allow us to set a “hiker’s cache” on the Noatak; after floating ~10 miles on the Alatna, we would hike Portage Creek with 6 days of food to leave on the Noatak. Our new route was 400 miles, ambitious for three weeks. I assumed 15 miles/day hiking and 25 miles/day floating, which wouldn’t be quite fast enough to get us through the route in time. I checked in with Brad Meiklejohn, Shasta Hood, Pat Farrell, and Roman Dial to see if those were reasonable paces. The general consensus was that 8-12 is a better goal for hiking, and 30 was reasonable for the water. To meet John at the food drops we would need to cover the full 15 miles/day on our hiking days. We’d also need the 30 miles/day on the water. This didn’t allow for any bad weather or recovery days. Long trips are always a balance of needing to cover ground vs. relaxing and enjoying the scenery. We spent a lot of time discussing our personal objectives and preferences. 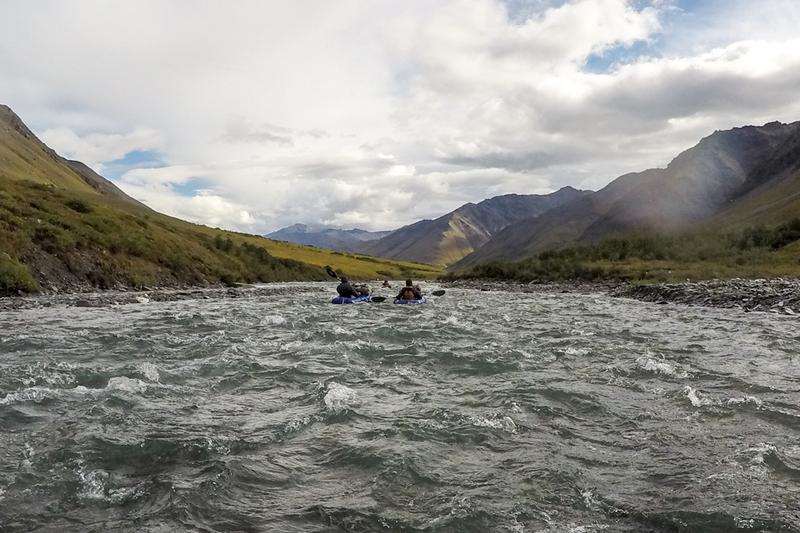 Everyone was up for a challenge, trying the hard pace, and we could always cut out the Arrigetch loop, going directly over Portage Creek to the Noatak. But the Arrigetch was the gem, the main allure for me, so I wanted us to push hard. This kind of setup the dynamic for the entire trip. I wanted to ‘bank’ any extra miles we could, anticipating bad weather, slow water, or bad tussocks that would kill our pace later in the trip. The need to push wasn’t quite as obvious to everyone else. And it turned out that we could have relaxed a bit, we finished a day or two early. As usual, we had a lot of help on this trip. Thanks to: John Gaedeke, Carol & Stan Histand, Dave & Ruthann Urban, Scott Lefebvre, and the City of Ambler for logistics help. Abby Laing, Malcolm Herstand, FILGO, Toby and Darcy, Eric Schmidt, and Frederique Beringer for loaning us bear bags. Margaret Archibald for Diana’s boat, Ryan Hokanson for Diana’s maps, John and Sande Christopherson for packing space, and Joyce and Barry Johnson for the pfd loan. Brad Meiklejohn, Pat Farrell, Shasta Hood, Molly McCammon, Roman Dial, and Thom Walker helped with route beta. This link to the Roaming Dials (http://packrafting.blogspot.com/search/label/Arctic%20Circle) is better beta on getting over Ariel than the link posted above. It has a topo map for instance. Brilliant trip guys! 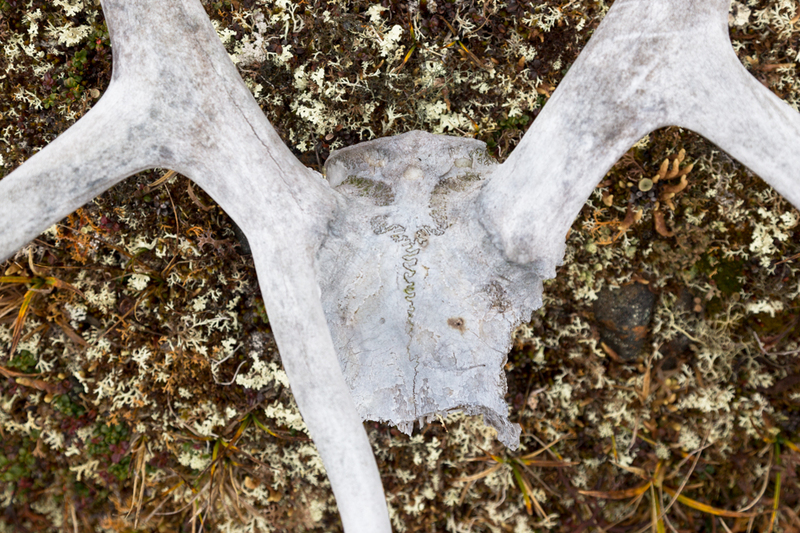 I went from Anaktuvuk Pass to Kobuk, with a little flight to save my wrecked feet from more walking, from Takahula (large lake south of Circle lake) to Walker Lake in August as well. Some friends flew into Takahula and we went up into the Arrigetch but got totally skunked by the weather. 18 days in the field, 12 solo days, and about 265 miles. I’m glad you got some lovely photos of the mountains as we only saw then for a couple hours out of the 6 days we were there. One of the few oil-on-canvas paintings I’ve ever done currently hangs on my wall. What of? Ariel, Xanadu, and Elephant’s Tooth. Hard for me to think it’s been 6 years since I was there, and I’m very glad you finally made your way there as well Luc. Did you make it up the Aquarius side valley left of Arrigetch Creek? We didn’t make it to the Aquarius side. The whole pod was pretty amazing. One disadvantage of this trip is that we didn’t have time for side exploration. We talked about it beforehand, planning a base-camp style trip with day hikes vs. a through-hike where the days are the day hikes. Awesome video. Thank you! We just returned from Denali but looking at your trip report I could start right away for the Arrigetch. It’s interesting that you spent so many thoughts on bear safety. My understanding was that – during the Classics – you do not care so much about bear safety (i.e. no bear canister, no Ursacks etc.). 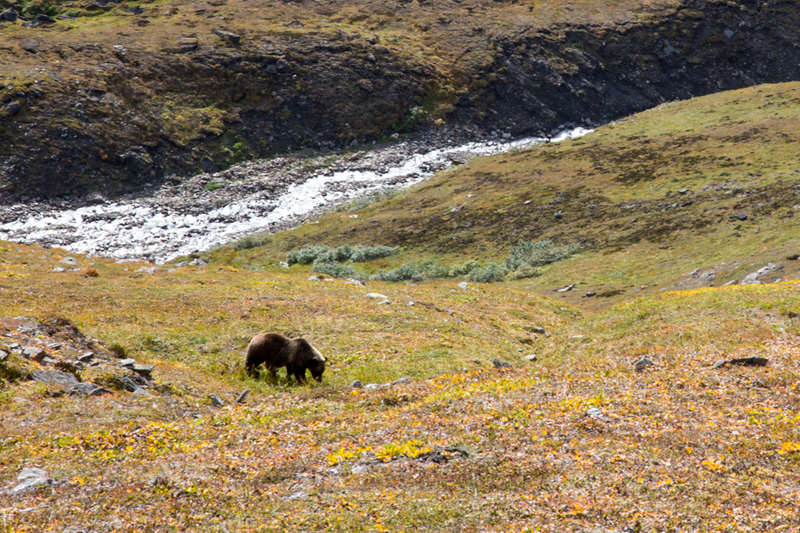 We saw 6 bears in Denali. But they were all “normal” and ran away. My girl friend thinks they are totally cute (even though I showed her photos of what they can do to a human). Ah, okay, the misunderstanding was mine. Yes, exactly right that we don’t carry gear for bear safety during the Classics (a few guys do), but that bear-safety and relevant gear was a high-priority on this trip. I wouldn’t say we “do not care so much about bear safety” on the Classics, we care! But the extra weight of Ursacks, bear spray, etc., gets moved into the would-be-nice-to-have-but-not-required part of the gear pile. We are very bear aware and make a lot of noise in the woods. I think everyone feels fortunate that there hasn’t been a bad bear encounter during the Classics. For all other trips I justify the extra weight of bear gear. My priority in bear country is group size (ideally 4+), then bear spray. I place a low priority on separating my food, because I’m usually on a through-trip and need the food. 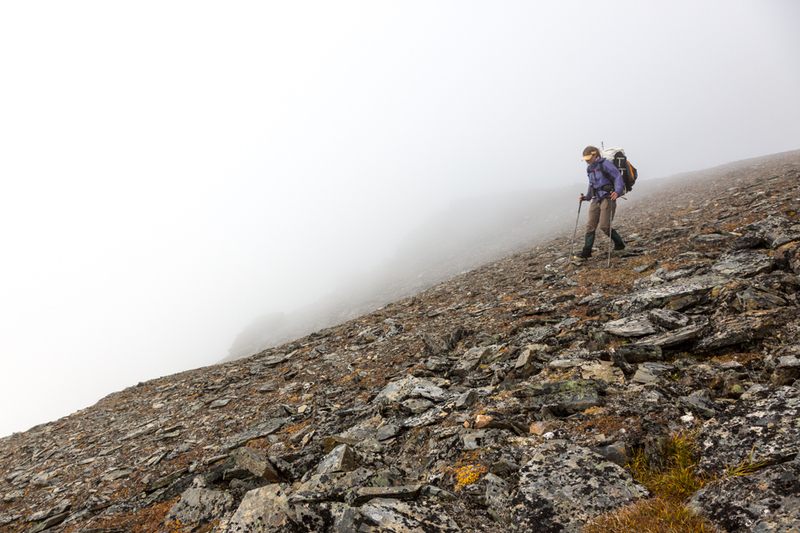 How many days did you spend hiking from the Hunt Fork to Gaedeke lake? And after that, how many days floating to Arrigetch Creek? Hi Geert- I have notes on how long we planned each section to take, but not how long they actually took. The actual time was within a halfday or so of the planned time. About the John River float, we are planning to go there in August. Would that still be accesible and mainly Class II? Hi Geert- My understanding of the Brooks rivers is that they are very rain dependent. You might not have enough water to float, and then it could be flooding 24 hours later. 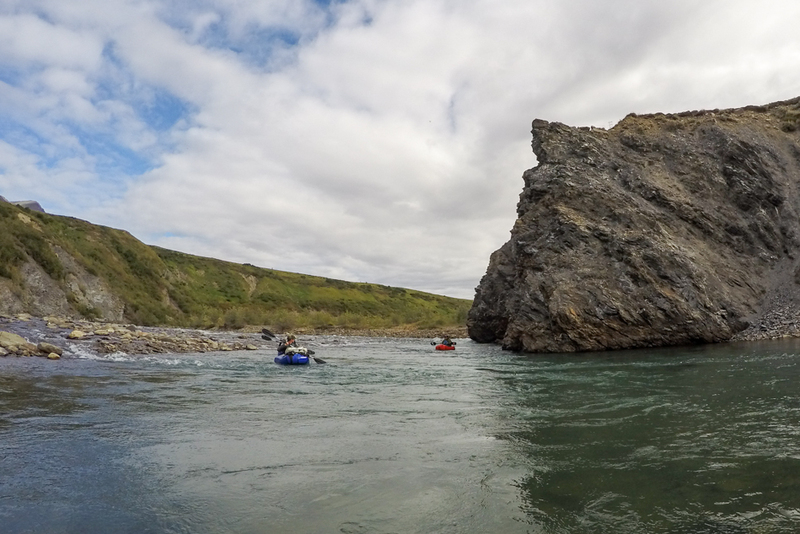 We were there in August, it wasn’t raining, and the John was class II in a few spots, the few ripples and rapids were fun, some rocks to maneuver around. Two weeks later and with some rainy days the Ambler River was flood stage. 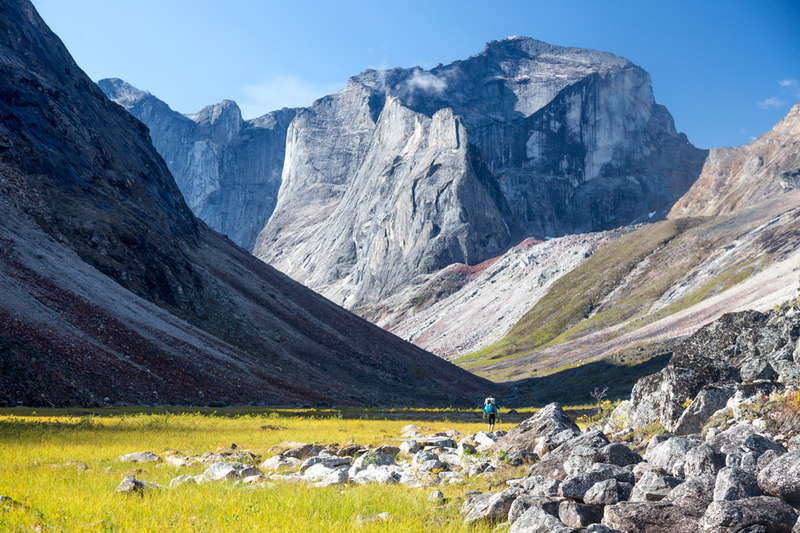 Planning a trip this July, starting at the point where you hiked from the Alatna to the Noatak to drop a cache of gear, then hiking back to the Alatna and floating to circle lake. Your trip reports are amazing, and I would love to pick your brain about a few questions we have! Hi Guido- You can download the kml from the map at the bottom of this trip report. Click on the ‘View Larger Map’ icon, then ‘Download KML’ from the menu options. It is pretty likely that you will run into snow, especially if you do end up going to the Arrigetch.